Description: Picot designs are vintage Macrame techniques frequently seen in patterns written in the early and mid-1900's. 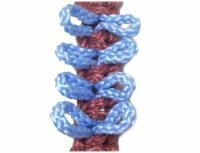 Picots are small loops that are arranged along edges of Macrame sennits, which are a series of knots. They are often used to add decoration, and make the item look more feminine. 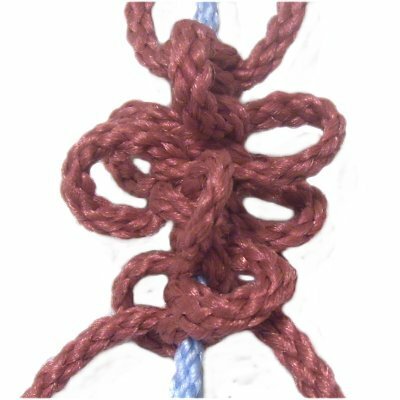 There are many ways to make picots, and they can be placed anywhere in a Macrame project. 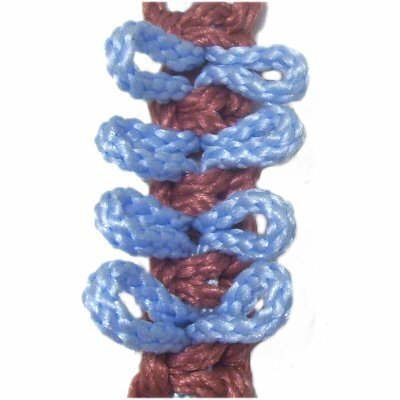 You can use these techniques when creating items like purse straps, bracelets, belts, etc. 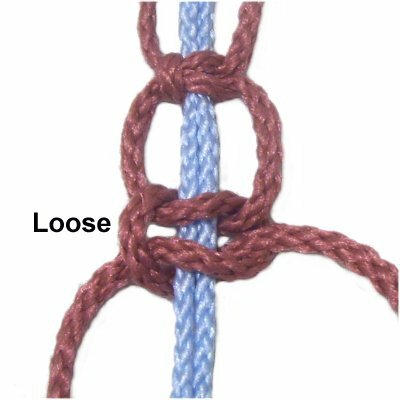 The first three techniques described below feature Square Knots. 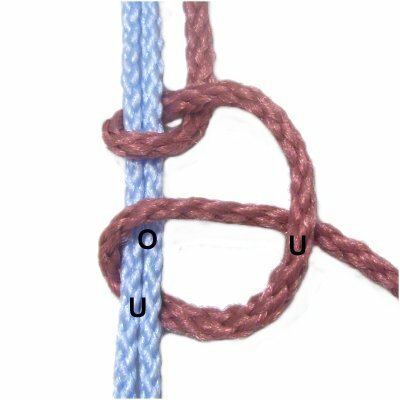 There are also two other types, one with Vertical Larks Head knots, and the other with the Spiral Stitch. 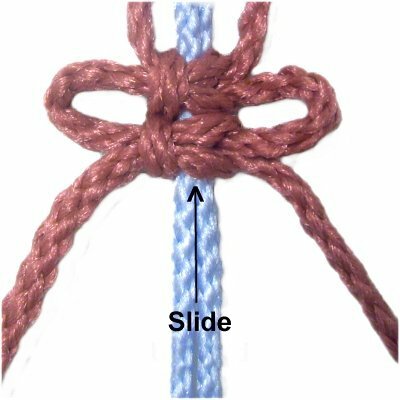 Click on the links above to practice, if you don't already know how to tie these decorative knots. Other pages you should review are Unique Mounting Designs and Picot Mounts. The designs show how picots can be used in the mounting process rather than in a sennit. 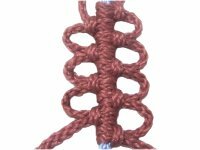 Here is a project that will help you practice making a sennit with Square Knot picots. It's called the Flower Bracelet, if you want to give it a try. 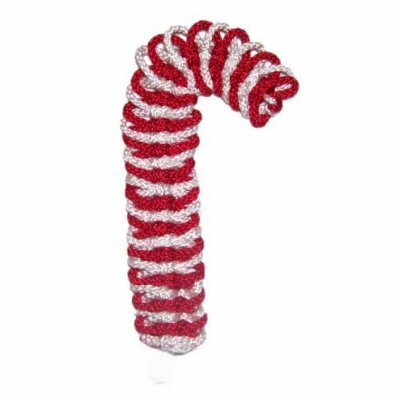 The Candy Cane is another fun project featuring picots. The first three Picot designs on this page are created using Square Knots. This particular design is the most common. The size of the picot loops is determined by the spacing of the knots. Determine the length of the area you wish to make with the picots, and multiply that by 15. That's how much material you need for just the area with the picots. This amount should be ADDED to the lengths needed for the rest of the project. Step 1: Secure two 18-inch filler cords, and two 36-inch working cords to your board. The fillers should rest between the working cords. Tie the first Square Knot with the working cords, around the fillers. 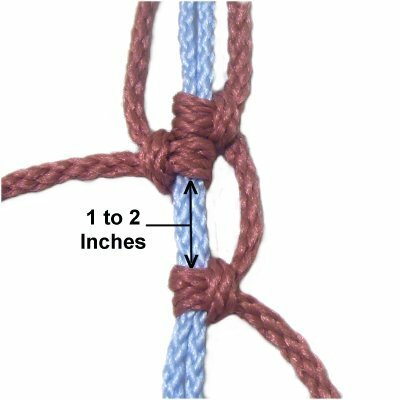 Step 2: Tie a second Square knot, so it rests at least 1.5 to 2 inches from the first one. Most Macrame patterns won't tell you the spacing, so you will need to experiment to see what size picots works best for your project. 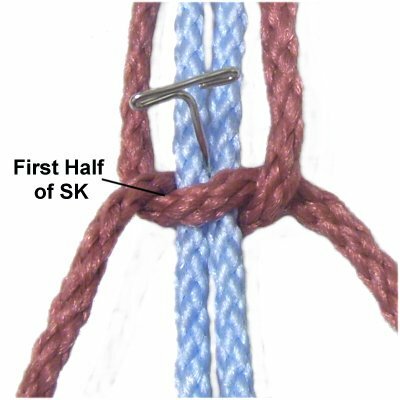 Step 3: Slide the second SK backward, so it rests against the first knot. The loops on both sides are the picots. Step 4: Tie the third SK. 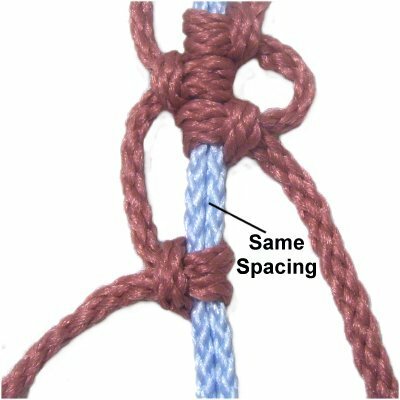 Make sure the distance between it and the previous knot is the same (see information below). Slide it up to form the next set of picots. 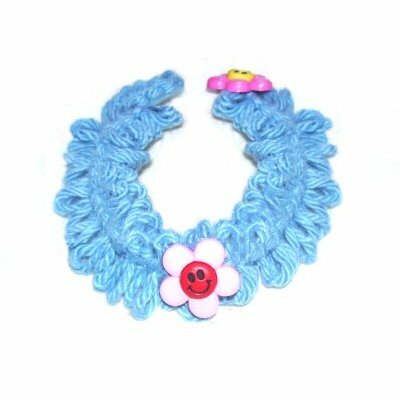 Designer's Tip: Picot designs are usually made with similar sized loops, but there are exceptions. For example, this tree shape was made by gradually adding more space between the knots. 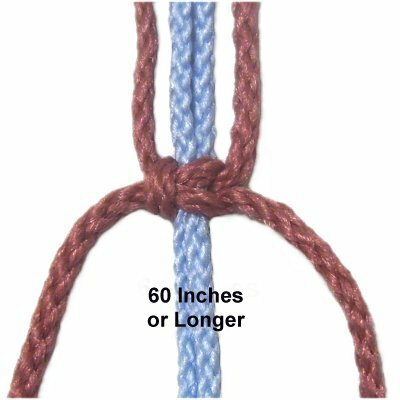 Make sure you read the Macrame pattern carefully to determine if they should be the same size. Step 5: To continue, tie several more SK Picots. In this image, the knots were all spaced 1.5 inches apart. Picot designs were very popular in the early 1900's. But they were usually made on one side only, which is what you will learn now. How this design differs from the one shown above is that you do not add space between the Square knots. 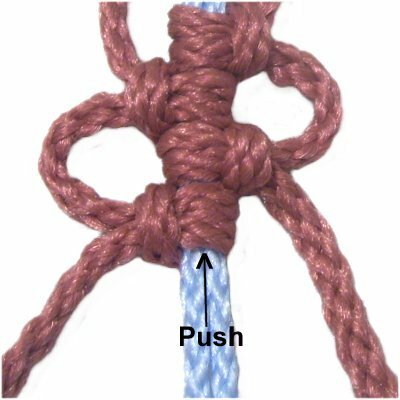 The example shows the picots on the left, using LEFT Square knots. 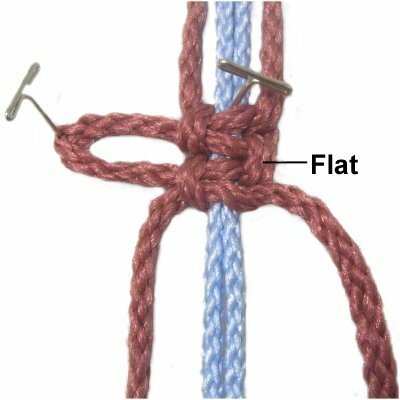 To make the picots on the right, tie RIGHT Square Knots, and pull the right working cord to make the loops. Repeat step 1 from the instructions above, tying the first LEFT SK. Step 1: Pull the left working cord to the left, and secure it at least 1-inch from the knot. The distance between the knot and the pin determines the overall size of the picot. Step 2: Tie the first half of a LEFT Square knot, keeping the secured segment in place. As you tighten, make sure the left working cord is straight and taut (horizontal). 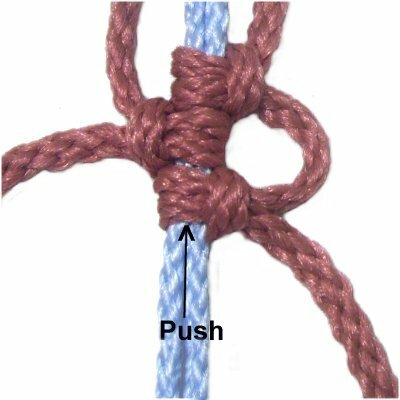 Step 2, continued: The right working cord should be pulled more than the left, so the segment between the knots is straight (vertical). Of all the Picot designs on this page, this one requires the most attention during the tightening process. Take your time and be consistent with the tension. 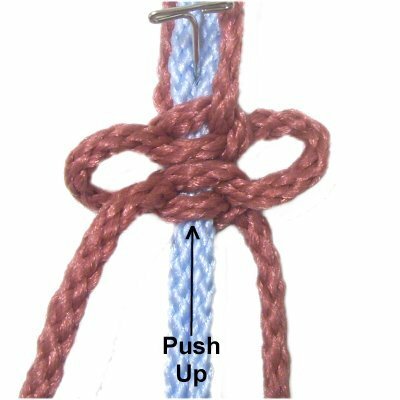 Step 3: Tie the second half of the Square knot, then tighten completely. Step 4: Repeat steps 1 - 3 a few more times, forming the rest of the sennit. Picot designs like this one are rarely used anymore. 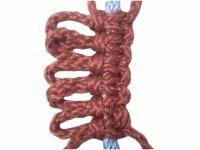 I found this technique in a Macrame book written in 1899. They are made by the fillers rather than the working cords. 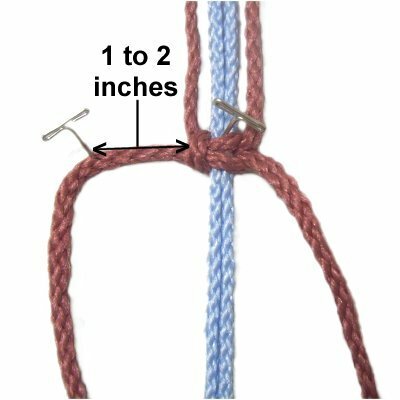 Should you decide to use it in a Macrame project, the fillers need at least twice as long as the working cords. Step 1: Secure two filler cords to your board, each at least 60 inches long. Place two 36-inch working cords on either side of it. Tie a Square Knot with the working cord, onto the fillers. Step 2: Tie a second SK at least 1-inch from the first one, but make sure it remains LOOSE (not tightened). Step 3: Pull the fillers upward, and bend them into loops. (Forward if upright). 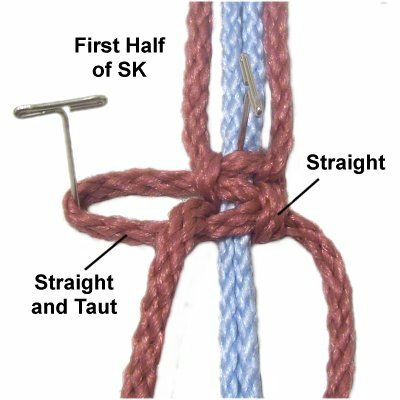 Gradually tighten the second SK tied in the previous step. Make sure it rests as close to the first SK as possible. Step 4: Repeat steps 2 and 3 at least three more times. Picot designs usually look better if you make several loops. 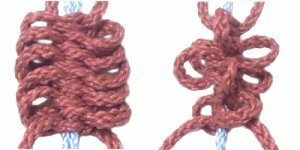 The remaining two Picot designs are not made with Square Knots. 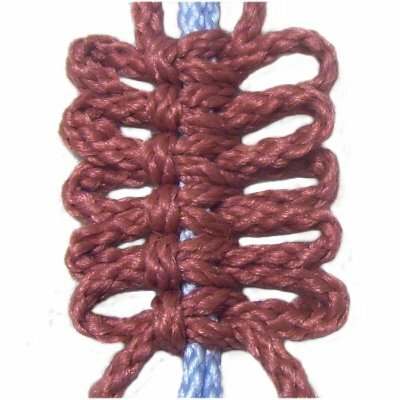 This design is made with the Vertical Larks Head knot. The size of the picots is determined by the amount of space between the knots, similar to the first set of instructions on this page. The picot loops won't be directly across from each other. 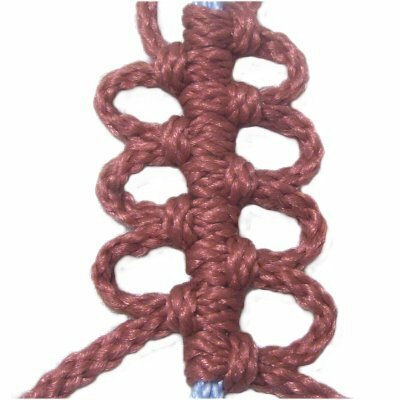 In Macrame patterns, a Square Knot is usually tied above and below this design. Step 1: Secure two 18-inch holding cords to your board. On either side, secure the working cords, which should be at least 36 inches long. 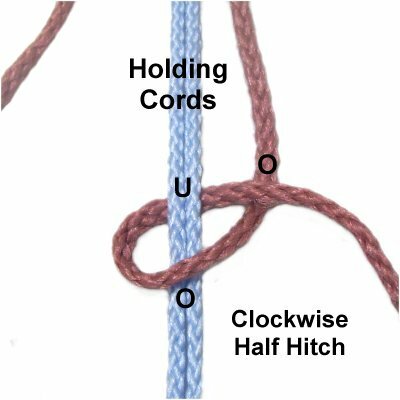 Tie a vertical Larks Head knot with the right working cord by making a clockwise loop over - under the two holding cords. As you pull it right, pass over the working cord. Step 2: Make the second loop, passing under - over the holding cords. Step 3: Use the left working cord to make the next Larks head knot onto the holding cords. 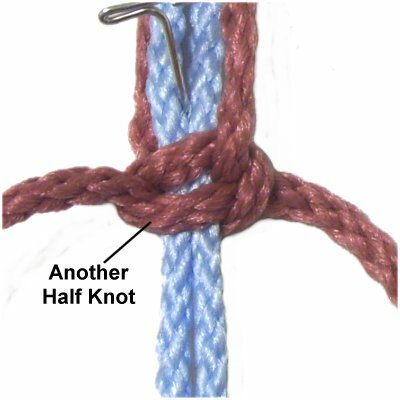 The loops are made counter-clockwise, and the two knots should be close together. Step 4: Tie the third Larks Head knot with the right working cord (clockwise). 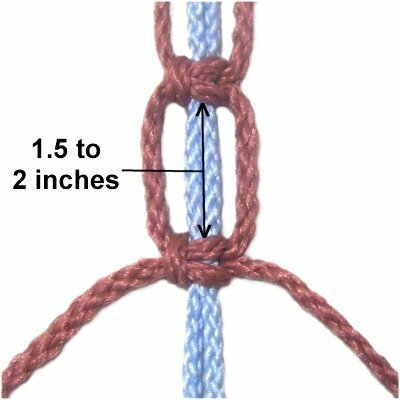 Tighten it so there is 1 to 2 inches between it and the second knot. Step 5: Push the third Larks Head back, until it touches the second knot. This forms the first picot on the right side. 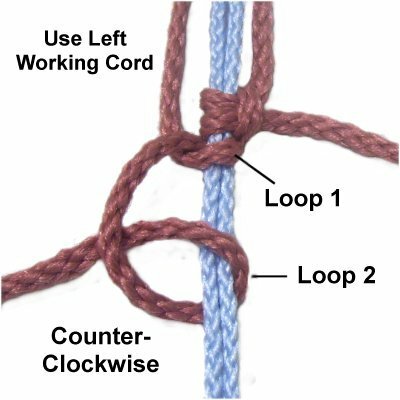 Step 6: Switch to the left working cord, and make the third Larks Head knot (counter-clockwise). 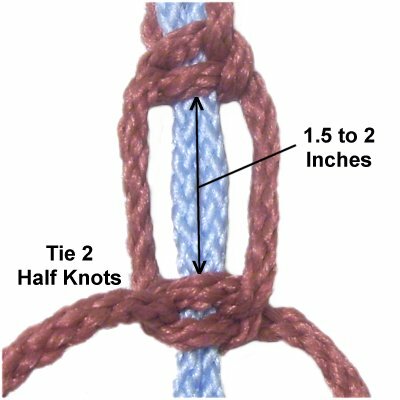 The spacing between it and the previous knot should be the same as in step 4. 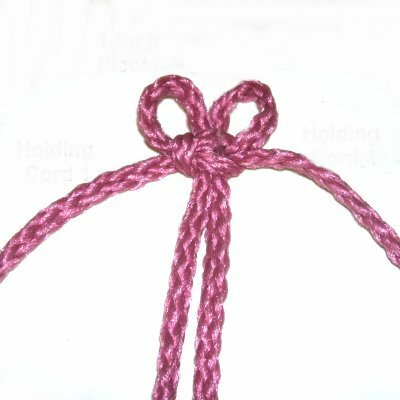 Step 7: Push the third Larks Head knot back to rest against the second knot, forming a picot on the left. 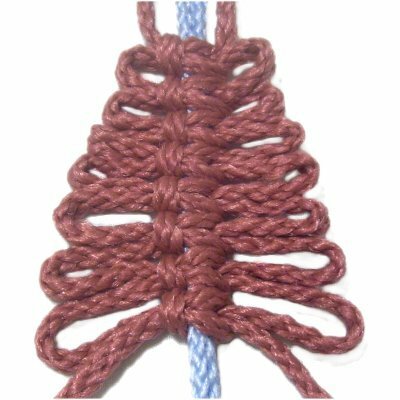 Designer's Tip: Picot designs can be used as attachment points for other cords, and this technique is especially useful for that purpose. There is more space between the picots, so any cords attached to the loops will be less likely to overlap and look crowded. Step 5: Repeat steps 4 - 5 to make several more Larks Head knots. Alternate back and forth between the two working cords. Picot designs can also be made with the Spiral Stitch, which is a series of Half Knots (first half of SK). 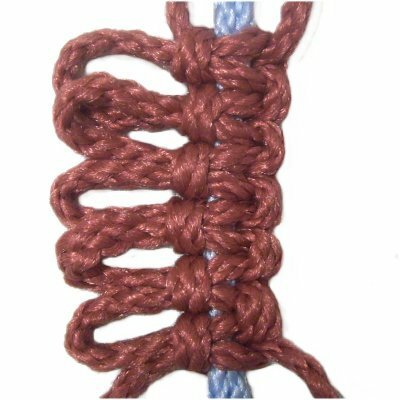 The best thing about this technique is that the picots can be twisted so they rest in different directions (shown above right). They can also be arranged flat (shown above left). The picots stack on top of one another, so the openings are vertical when held upright. Like the first Square Knot technique, the size of the picots is determined by the spacing of the knots. Step 1: Secure two 18-inch fillers vertically. On either side, secure two working cords that are at least 36 inches long. 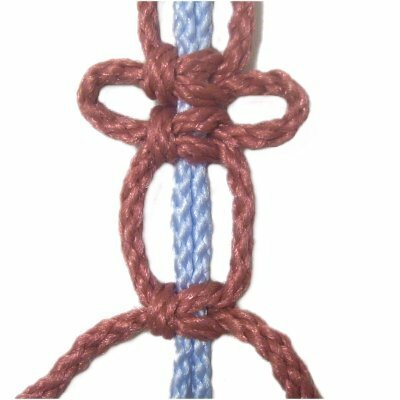 Tie the FIRST HALF of a left Square Knot with the working cords, onto the fillers (Half Knot). Step 2: Tie another Half Knot, placing it against the first one. Step 3: Tie TWO Half Knots, after moving forward at least 1.5 to 2 inches. 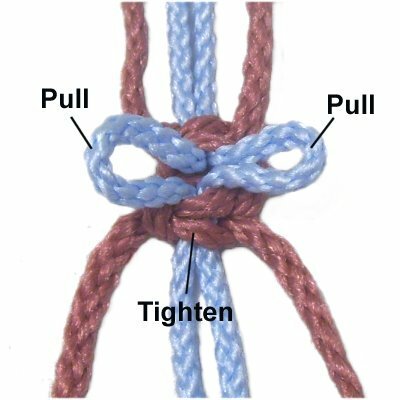 Picot designs need stable knots, which is why you MUST tie two Half Knots every time. Make sure the knots are firmly tightened. 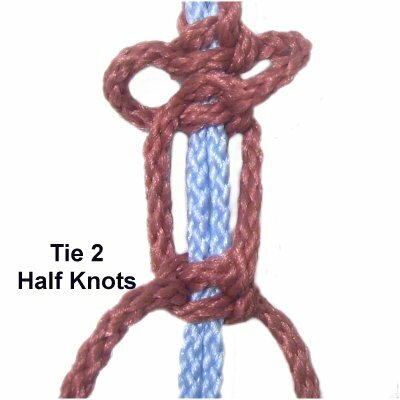 Step 4: Push the second pair of Half knots back, so they rest against the first two you tied. Step 5: Repeat steps 3 and 4 at least two more times. Remember that Picot designs are usually made with several knots to form a sennit. The Half Knots won't spiral on their own because there is too much space between the knots. But you can twist the picots in different directions if you wish. Have any comments about these Picot Designs? Contact Me.